don’t throw shade. GROW it. The Trees Columbus Canopy Restoration Project is an extraordinary urban forest restoration initiative developed in and for Columbus, Georgia. Healthy urban trees provide environmental, economic, and sociological benefits, and the Canopy Restoration Project will improve the health of our urban forest. Columbus continues to lose urban forest canopy due to age, disease, storms, and development. The Trees Columbus Canopy Restoration Project creates a public-private partnership to implement creative solutions for urban forest planting, management, and storm response. Trees are good for business, health, and social well-being. The Canopy Restoration Project will plant and maintain a healthier urban tree canopy for tomorrow and for future generations. Funding provided by the Mildred Miller Fort Foundation, Inc.
why do we need the project? To promote the health of mature trees. To establish a process to identify and mitigate potential safety issues. 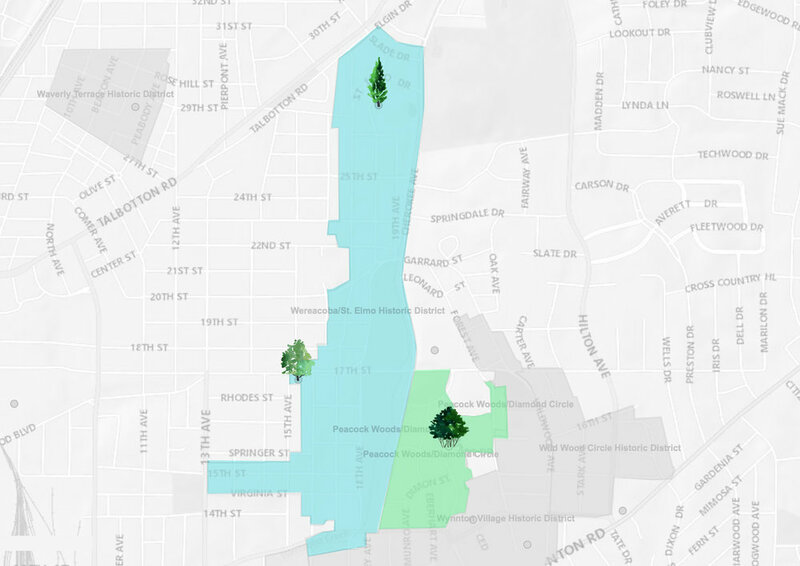 The vast majority of Muscogee County’s urban tree canopy is on private property. The Canopy Restoration Project will connect to private property owners with education and resources. In partnership with Columbus Consolidated Government, evaluate tree canopy on public rights-of-way to establish tree maintenance and planting priorities for healthier urban tree canopy. In partnership with private citizens on a volunteer basis, evaluate residential tree canopy to establish tree maintenance and planting priorities for healthier urban tree canopy. Create a replicable process that can be repeated throughout Muscogee County and beyond. Tell us a little about where you live and we’ll come and assess your property.